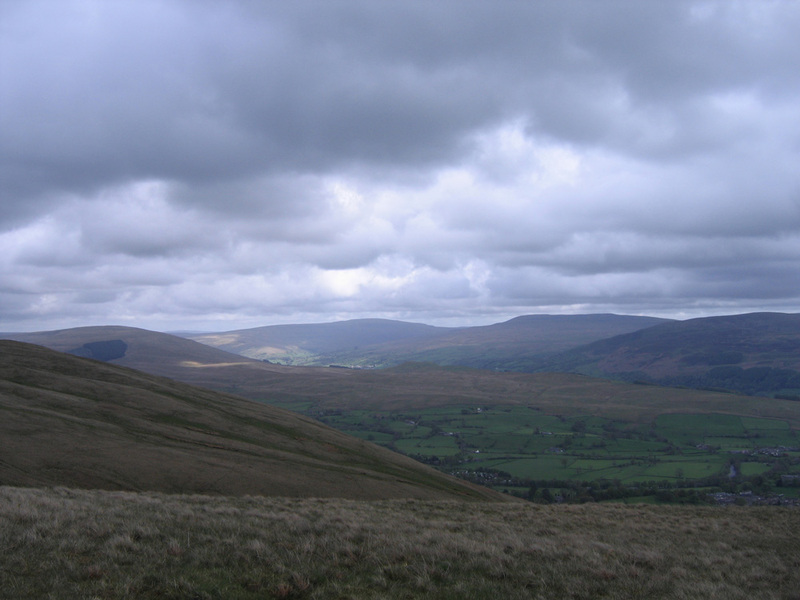 One night I decided, just as the light was disappearing, to hasten up the fell, 1,955 feet of steep climbing right up to the summit of Winder. A lung-opening, blood-stirring, bone-strengthening lunge of an effort, guaranteed to leave you feeling at first terrible and then, as your body begins to recover, elated while surrounded by sweeping views up in the clouds. Going up the hill at night is even more exhilarating than a daytime jaunt because you are racing against the dark and know that you will probably have the summit and the ridge all to yourself to scream or dance or quickly scrawl a sketch. 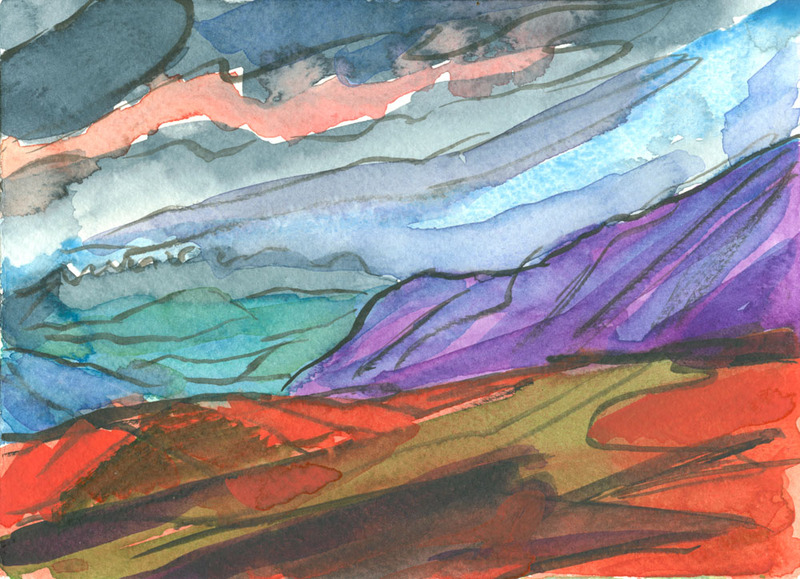 On this particular evening the sky was full of threatening clouds but, as I stepped across the windy ridge that links Winder and Arant Haw, with views west over the Lake District mountains, there was a single band of red sunset colour streaked across the grey. The strong dark shapes of the clouds and the dash of colour seemed to vibrate above the steep plummeting hill slopes that run away from the ridge to right and left and the scene painted itself in my mind’s eye, making me promise to return. 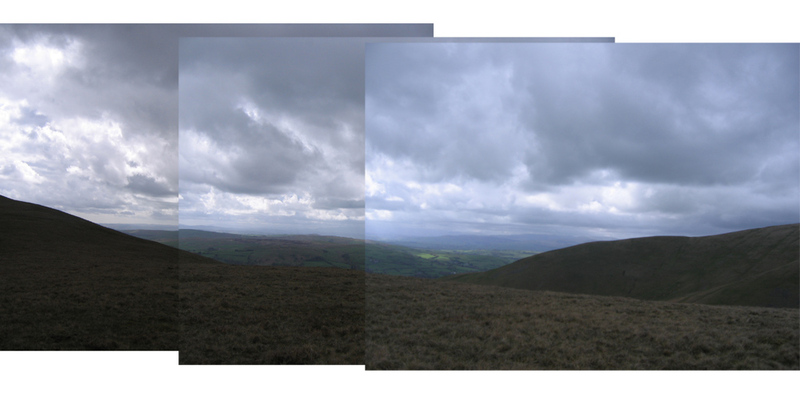 This afternoon I dodged rain storms and braved an icy wind to take photos, subsequently joined together, of that view. The forecast promised worse this evening so no return trip was made and no sunset recorded. Following my original night-time foray I had created a watercolour from memory to test my first impression of the night-time experience, to see if I could capture the feel of that moment on the ridge. During today’s afternoon visit I quickly made a pencil sketch before my hands went numb. 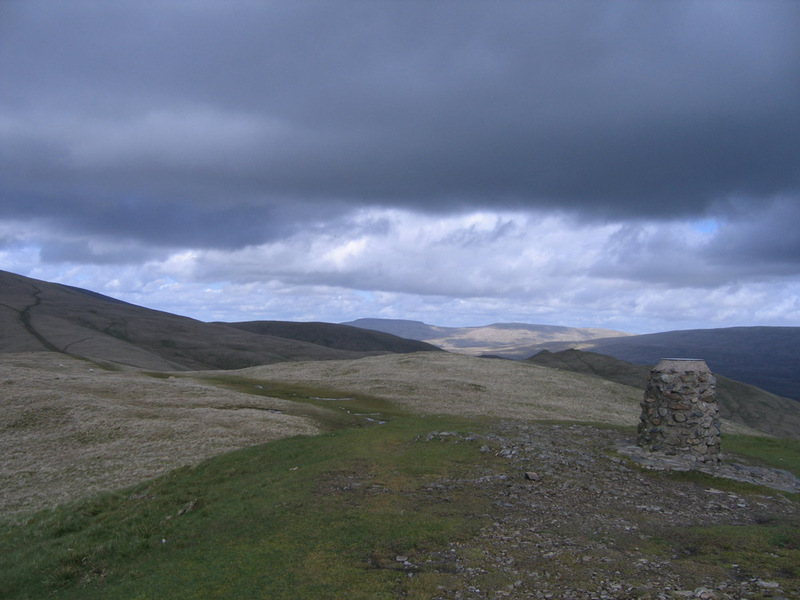 The sun was trying to break through as I approached the summit of Winder, creating some interesting patterns of light and dark. Over in Dentdale the village of Dent was bathed in sunshine while I was donning a rain jacket on my journey across the heights. Proving that, once again, my trying to carry out any art-related activities on the hill activates some kind of spoilsport alarm, a team of film-makers arrived just as I was reaching the spot where I wanted to stop and sketch. 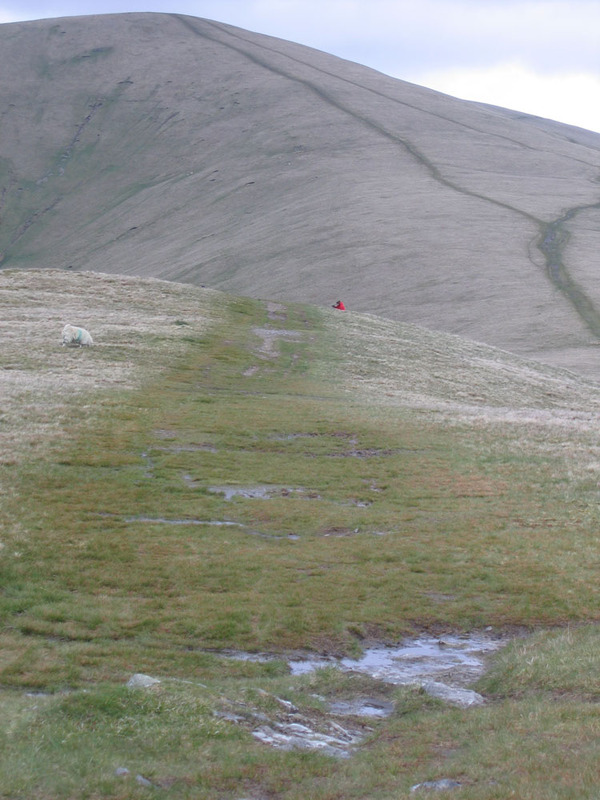 They, naturally, chose the same area I was interested in to set up their tripods and proceeded to record a local guide and her party of walkers treading the path to Winder. Resigned to my fate I skirted around them and assumed they would be there all afternoon but – no – in a matter of moments they were gone! My sketchbook was released from its bag and I managed to get down the basics of the scene I have in mind to paint before succumbing to hypothermia in the biting wind. Who knows what will happen when I return with my paints – maybe a parade of unicyclists or a troupe of accordion players will march over the horizon … but it will make for an interesting blog post nonetheless. I have two rules in life – to hell with it, whatever it is, and get your work done. 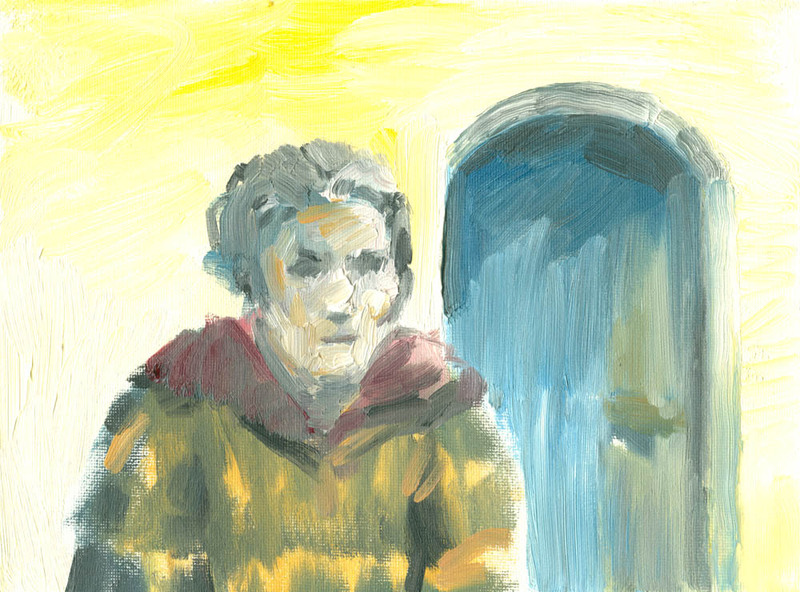 This entry was posted in drawings, landscape, walking and tagged Arant Haw, coincidences, distractions, landscapes at night, sketching out of doors, studies for paintings, Winder on May 19, 2015 by fellpainter. What makes some paintings into premonitions? Is there something in the human mind that can peer into a dim future and translate it into paint? Some shadowy rather scary things have been happening of late. The blog has been neglected while I tangled with them. Before even an inkling of anything occurred I decided to paint a small self-portrait – just a quick sketch – of me turning my back on the void. There even seems to be evidence of a haircut in there, foreshadowing the fact that, feeling disturbed, I would soon reach for the scissors. 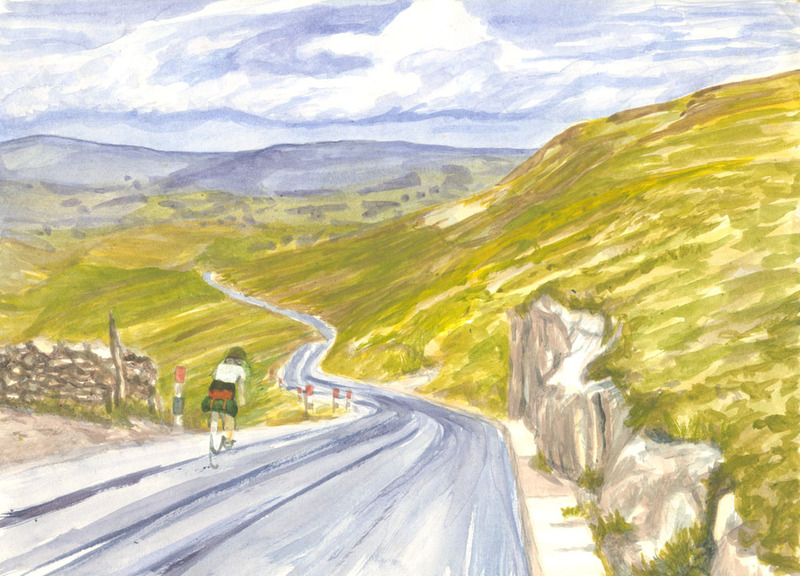 Another odd coincidence involves a picture painted while I was still at school, of myself cycling down the notorious Fleet Moss – a climb so steep that a cautious descent involved passing others who had chosen to walk down for fear of somersaulting over their handlebars. The point in the road captured in that painting was, many years later, the place where my chain snapped while struggling up the same climb, optimistically attempting to tow a trailer loaded with camping gear. Something had to give and it wasn’t going to be my legs so the metal sacrificed itself instead, throwing me instantly onto the tarmac. Did I know, all those years ago, that that spot high in the Yorkshire Dales on a terrifyingly steep bit of road was going to feature again in my life? Who knows? Something compelled me to paint that section of rearing tarmac. It’s just as mysterious considering what draws artists towards those motifs that they become associated with forever, in the way that Mont Saint Victoire is synonymous with Cezanne. Why do certain scenes lodge in the brain, winkling their way into the psyche and why is it so much harder to paint well without that peculiar overwhelming instinct? Maybe some painters can manage it but I always find things flow much more easily when the subject itself takes over. Are premonitions just coincidences? Even if they are, coincidences are strange things in themselves. Therefore, how we explain coincidences depends on how we see the world. Is everything connected, so that events create resonances like ripples across a net? Or do things merely co-occur and we give meaning to these co-occurrences based on our belief system? Lieh-tzu’s answer: It’s all in how you think. A certain man once lost a diamond cuff-link in the wide blue sea, and twenty years later, on the exact day, a Friday apparently, he was eating a large fish – but there was no diamond inside. That’s what I like about coincidence. This entry was posted in landscape, paintings, thoughts about painting and tagged choosing what to paint, coincidences, Fleet Moss, letting the subject take over, motifs, paintings as premonitions, premonitions, self portrait on May 5, 2015 by fellpainter.